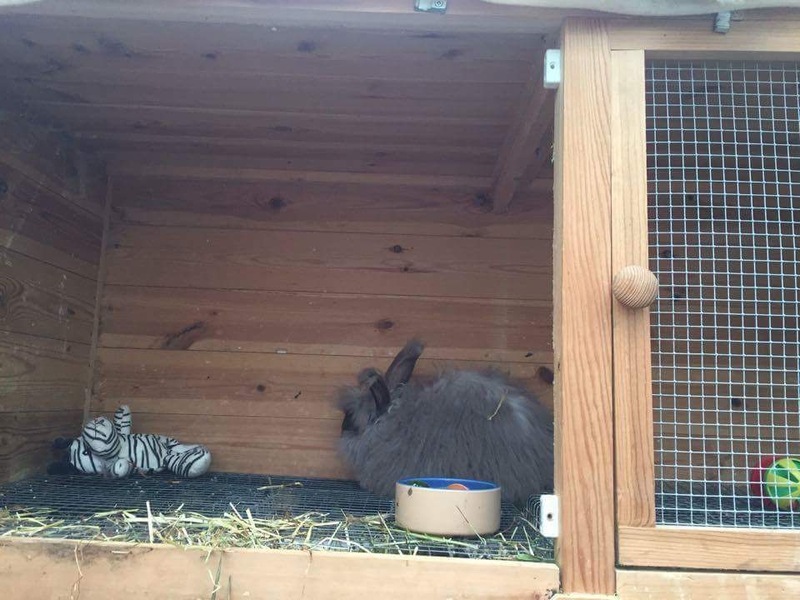 Hutches can be a challenge, getting the right size, shape and fit for your environment. These are a few ideas based on what our members do. Hutch size should ideally be 5ft long 2” wide and approx 2” high as Angoras like to stand up and look around. If your rabbit is able to go out on the lawn or in a pen daily, size is not so important although it’s easier to have a bigger one. 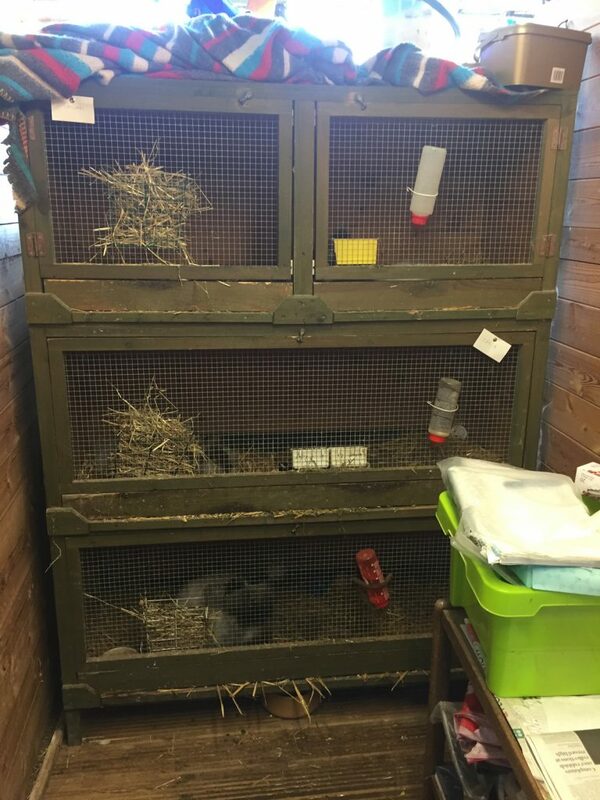 Not all need to have breeding compartments, but litter boards are essential, so bedding does not drop out when the door is opened. Weld mesh is best for the doors as chicken wire is not fox/dog/badger proof. The mesh must be small enough to exclude rats and mice. 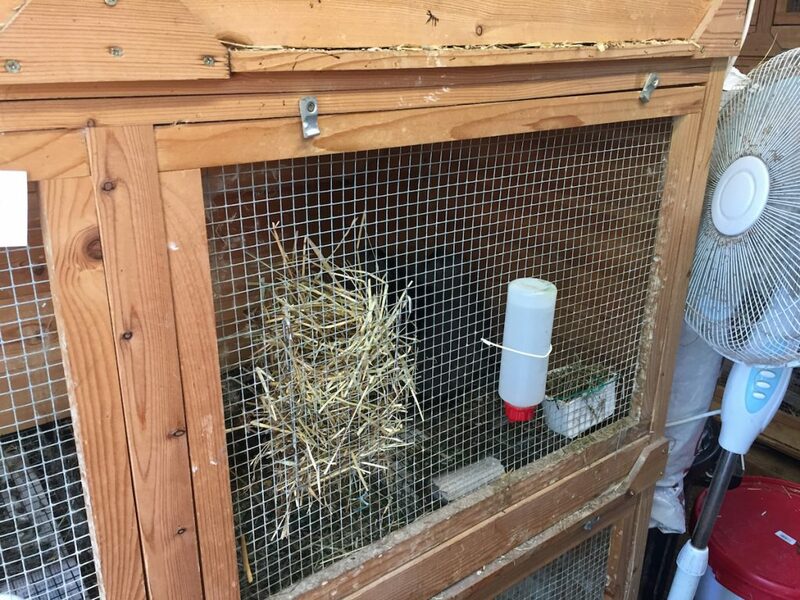 An internal partition may rub the rabbit’s wool as it passes through, and is not essential, even for outdoor rabbit hutches. The rabbit also has more room to hop. However, shutters are advised for the weldmesh front of an outdoor hutch for bad weather. A shutter covering 3/4 of the front leaves a space for vision and for ventilation. Show angoras will need to be put on wire from eight weeks to the end of their show life, which as at the most 8 months old. This is because they should have very thick and long feet furnishings. 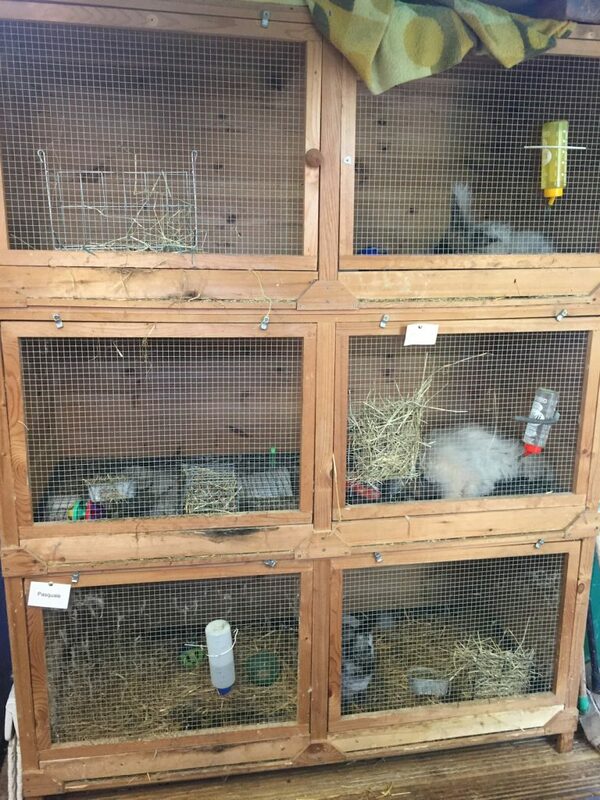 If they are kept on straw and woodchip etc, it will get into these and their coats and they will not make the show bench. As soon as they are clipped, they can be treated normally, and bedded on shavings and barley straw. It is not necessary for the hutches to be in a shed, but they should be waterproof. 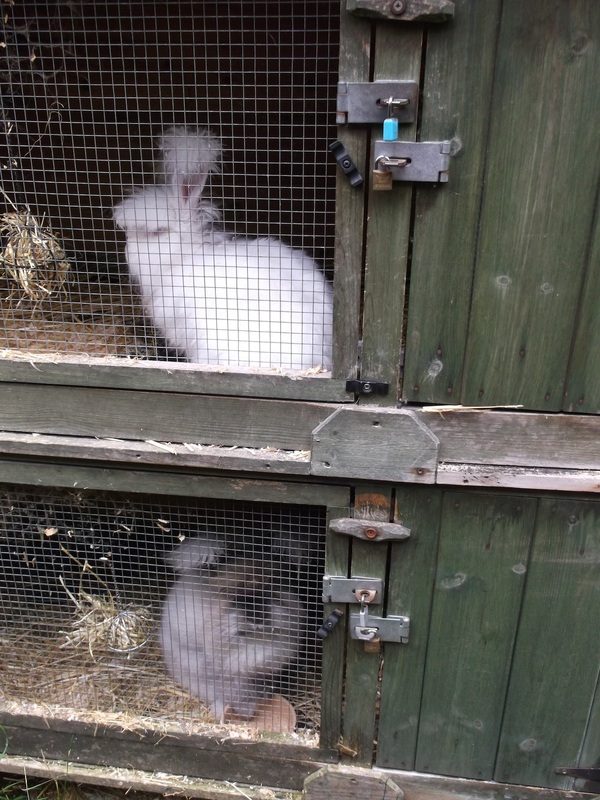 The shed is better for us for cleaning out and grooming, particularly in winter. 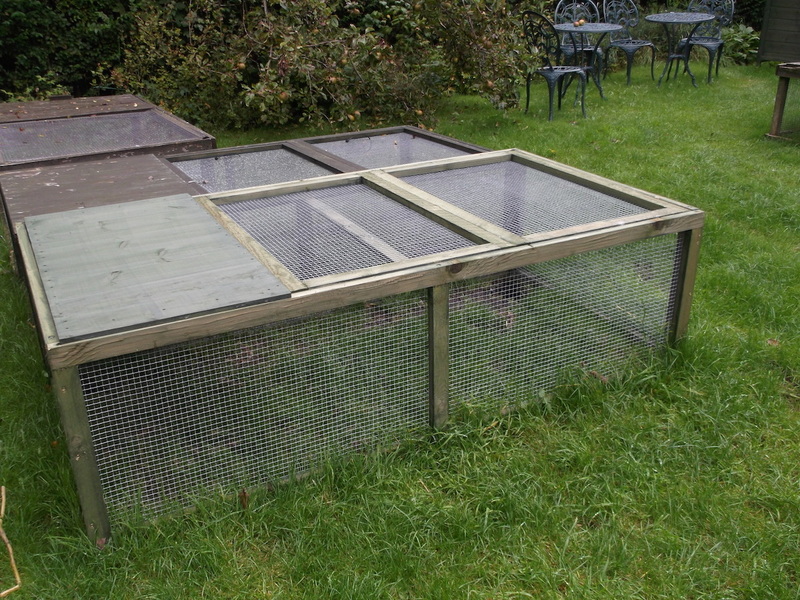 Plywood hutches are not suitable for outdoor use, as they are not fox-proof or weatherproof. 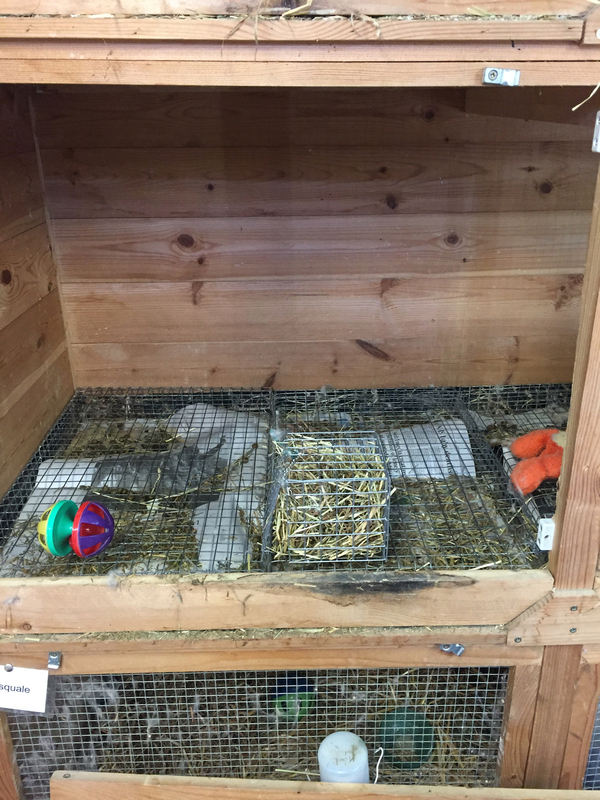 Outdoor hutches should be made of tongue and groove wood, covered in preservative and have a felted roof projecting around the hutch. Secure catches are essential, and padlocks protect against vandalism. Attached free access runs are not suitable for outdoor Angoras, as they will happily lie in the rain. They enjoy regular exercise on dry days in secure runs. Angoras enjoy digging (see hole in far corner of run!) 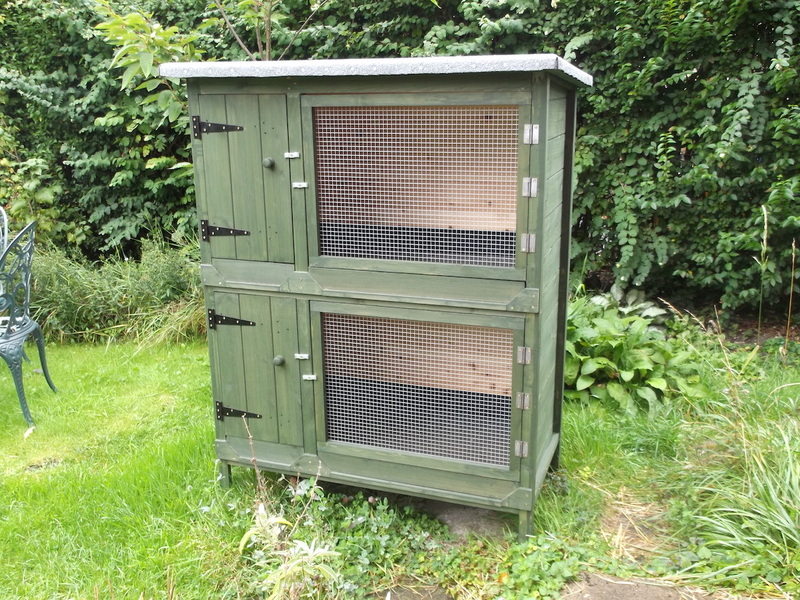 Examples of outdoor hutches are given below. A third of the hutch is boarded in for shelter. You can buy ready made hutches as well as commission hutches from a local carpenter if you cannot find the hutch style or type you want. 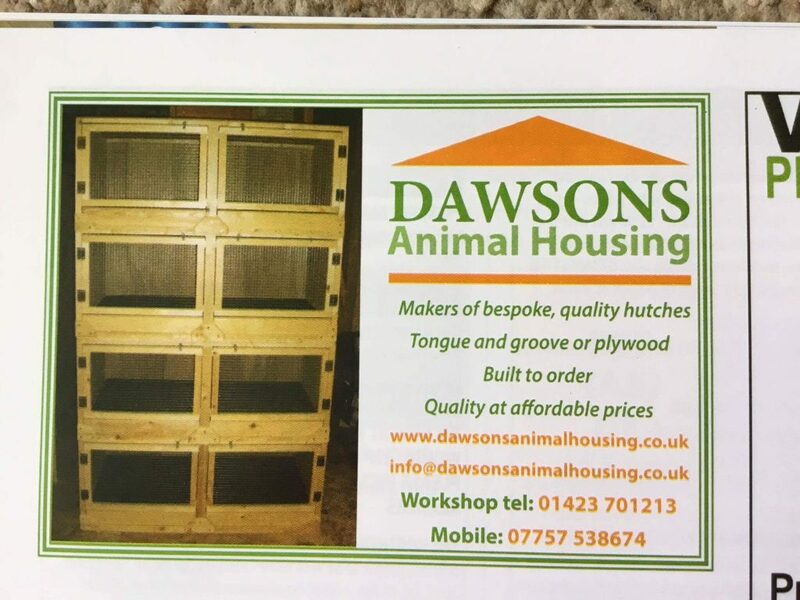 Below is an advert for Dawsons Animal Housing which is one source of good quality rabbit hutches. Posted 16/11/2017 by LH & filed under Angora Welfare.